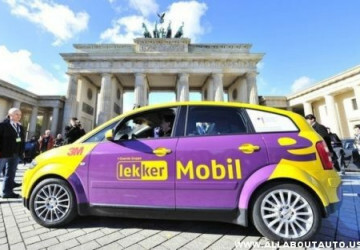 Little Lekker Mobil, a four-seat Audi A2 refitted with an experimental electric powerplant as part of a government sponsored project with Germany's lekker Energie and DBM Energy, just completed a 372-mile (600-km) stretch of road between Munich and Berlin on a single charge, a journey that lasted around seven hours. Even with the heater running, the modified A2 with fully usable trunk arrived with spare electricity in the "tank." 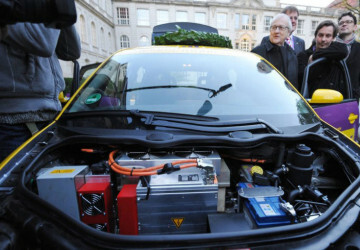 The battery uses DBM Energy's KOLIBRI AlphaPolymer Technology said to be 97 percent efficient and chargeable from virtually any socket -- plug it into a high voltage DC source and it can be fully charged in just six minutes according to the car's driver and battery inventor, Mirko Hannemann. While Hannemann wouldn't be pinned down on pricing for the battery, the 27 year old did say that it would be more powerful and cheaper than conventional lithium ion batteries. He even went so far as to suggest that his company was ready to begin mass production of the batteries now -- presumably aided by the large sacks of money he'll be handed after pulling off the record breaking stunt.